Introduce restorative practices and key concepts, including: (1) many people are affected by our actions; (2) there are many ways in which people are affected; and (3) if we understand how people are affected we can figure out what needs to be done to makes things right. Students will be able to identify people who are affected by a hypothetical situation and will be able to explain how they were affected. Students will learn how “making things right” differs from punishment. This lesson plan requires you to be prepared to tell a story that illustrates restorative practices. 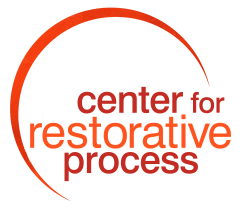 What is an experience you’ve had of how restorative practices have helped to make things right? Anyone who has used restorative practices many times will have some great stories to tell. Post the circle guidelines. If your class has made a poster of agreements, post those also. You will need a talking piece for this lesson. You are encouraged to have materials to create a center for the circle. You will be using the whiteboard extensively during this circle. Move into the circle and set up the center.Pass the talking piece and invite students to respond to a check-in prompt. Typically the chart will become much more complex than the one shown here, with many more ideas about how people are affected. Tell a story that illustrates restorative justice in action. Explain the difference between punitive and restorative approaches. Draw a chart like the one below on the whiteboard to support your explanation. Using the punitive method, what would have likely happened to the wrongdoer in the story I just told? What would have happened to those who were harmed? How does this compare to what actually happened? The Chips Scenario Restorative dialogue requires its participants to shift their thinking about wrongdoing from “who is wrong and how should they be punished?” to “who is affected by what happened, and how?” The ability to ask and answer these questions is the essential prerequisite for coming to agreement about how to make things right. How are people affected (which includes what we mean by “affected”)? What are restorative actions—things that can make things right without over-reliance on punishment? 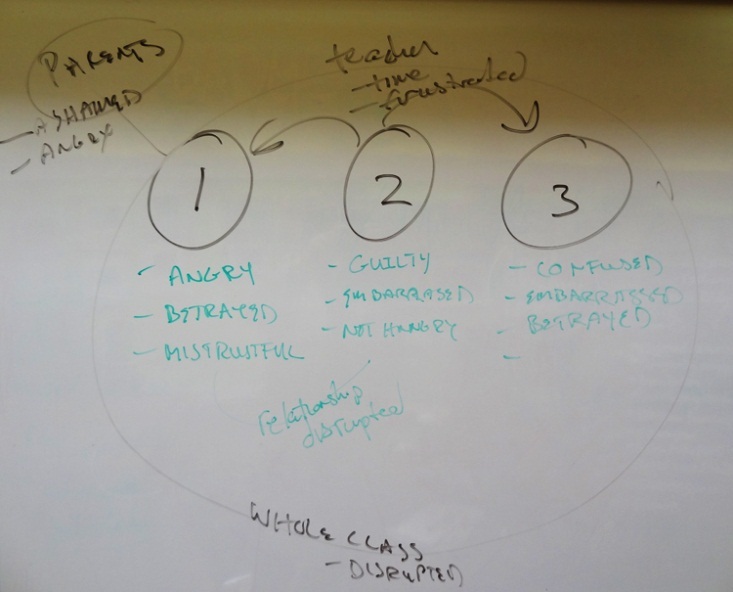 Draw three circles on the whiteboard, each representing a student in the scenario. Label them students 1, 2, and 3 (see illustration, next page). Record answers, asking prompts as necessary. Most circles will have many answers for each of the students. Record answers. Allow students to think of parents, teacher, principal, and others. Modify the scenario as necessary to be relevant to the grade level and social situation of your students. Some classes have found this activity to be very helpful and have applied it to actual situations, using it as a form of peace-making in the classes whenever issues and conflict emerge, by charting maps of those who were affected, how, and what can be done to make things right. Depending upon the grade level and the culture of your school and classroom, substitute any other item for chips. For example, cell phone or iPod.